The sulphur-crested cockatoo is one of the largest of the several species of beautiful white cockatoos. Although spectacular in appearance, this large parrot is very large, very intelligent, very long-lived, very noisy—and very challenging to keep as a pet. This is a bird for experienced owners who are up to the task. For a motivated owner, though, the sulfur-crested will be a once-in-a-lifetime pet. The sulphur-crested cockatoo is also sometimes known as the greater sulphur-crested cockatoo to distinguish it from another species, the lesser sulphur-crested cockatoo. Triton cockatoo, Cacatua galerita triton, found in New Guinea and surrounding islands. Eleonora cockatoo, C. g. eleonora, found in a few eastern Indonesia islands. "Standard" sulphur-crested cockatoo, C. g. galerita, found in eastern Australia. This is the subspecies most commonly adopted as a house pet. Another related but distinct species is the lesser sulphur-crested cockatoo (Cacatua sulphurea sulphurea). It looks similar to the sulphur-crested cockatoo, but occupies a different geographic range and is not a common pet specimen. Sulphur-crested cockatoos are native to eastern Australia, and north into New Guinea and east to New Zealand, where the preferred habitat is along the edges of tropical and subtropical rainforests. They are also a familiar sight in urban areas. In some parts of Australia, the bird is so plentiful that it is regarded as a nuisance. The Wild Bird Conservation Act prohibits the import of sulphur-crested cockatoos into the United States, so most pet birds now are captive-bred. The sulphur-crested cockatoo subspecies vary in size, with the largest subspecies (C. g. galerita) reaching an adult size of about 20 inches from beak to the tip of the tail, and weighing nearly 2 pounds (31 ounces). Sulphur-crested cockatoos have quite a long lifespan, with some living up to 80 years in captivity if cared for properly. This is a more difficult pet species than other cockatoos. The sulphur-crested cockatoo has a piercingly loud shriek and is prone to sudden, unpredictable movements that can be startling, although the intent is rarely aggressive. It is also a very demanding bird that can become self-abusive and destructive if it does not get the attention it needs. However, owners who are knowledgeable and willing to put in the time necessary can be rewarded with a wonderful pet that has the same virtues as other cockatoos. Sulphur-crested cockatoos are primarily white, with black beaks. They sport a beautiful crest of yellow feathers on top of their heads—the feature that gives them their names. Sulphur-crested cockatoos are large birds that need very spacious enclosures. At a minimum, the cage should have a footprint about 40 x 40 inches, at least 60 inches in height. A bigger cage is better, and best of all is an aviary environment. Cockatoos are known to be affectionate species among the various types of parrots, and the sulphur-crested is typical in this regard. Cockatoos are also quite demanding of time and attention, and here, too, the sulphur-crested is typical and even extreme. This is a bird that has a need for near-constant attention from its owner. Potential owners should recognize that unless these birds receive adequate exercise and mental stimulation, they may be driven to behaviors such as feather plucking and destructive chewing. To avoid these behaviors, owners must be diligent about providing their pets with plenty of toys and attention. Sulphur-crested cockatoos are regularly abandoned by owners who are not up to the challenge. But these birds can be fine pets for bird lovers willing to devote the time and energy to devote to forming a strong bond with a bird. A sulphur-crested cockatoo loves to be handled but also needs enough alone time to learn self-sufficiency. This is no small feat, but for those that can provide for its needs, the sulphur-crested cockatoo makes an excellent pet that is capable of learning speech, tricks and a variety of behaviors. Sulphur-crested cockatoos must be purchased from a breeder. Do your homework, and if possible spend time with a sulphur-crested in a home environment to develop a sense of what it takes to be an adequate owner. This is a loud, large, active bird that will expect a lot from its owner. Young birds will be easiest to train and socialize. 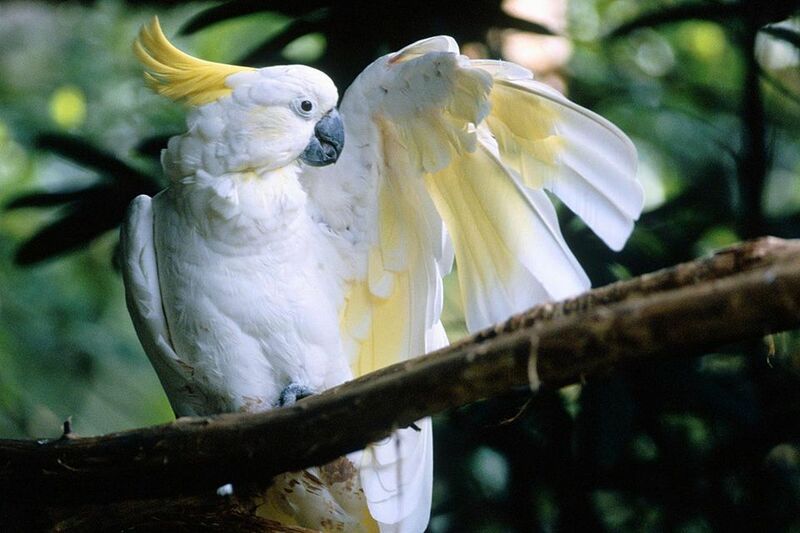 In the wild, sulphur-crested cockatoos feast on seeds, grain, and insects that they harvest from trees. In captivity, they need a varied diet that includes high-quality pellets and seed, fresh fruits, and vegetables. Experienced owners of sulphur-crested cockatoos take great care in preparing their birds' diets, as cockatoos can quickly suffer from the effects of poor nutrition. The sulphur-crested cockatoo is a highly active and lively bird that requires plenty of exercise to maintain proper health. Owners of sulphur-crested cockatoos should allow their pets a minimum of 3 to 4 hours of outside-the-cage playtime every day. It is also important for owners to provide plenty of space for the bird to climb, stretch, and flap its wings. Most cockatoo owners provide their birds with play stands or special perches for their exercise needs. The health issues with sulphur-crested cockatoos are similar to those for other cockatoos and parrots of similar size. But this bird is especially prone to rebellious behavior problems if its needs for attention are not met. Feather-picking and more serious self-mutilation can be an issue with bored or neglected birds. Destructive chewing is also common. Like other parrots, sulphur-crested cockatoos are prone to fatty tumors if their diets do not include enough fresh vegetables and fruit. This species is also prone to psittacine beat and feather disease (PBFD).